Summer months can be intense for randonneurs. While the spring ACP Super Randonneur series’ have mostly been completed, summer is often when randonneurs take advantage of the long days and warm weather to ride their brains out. That could be through touring, more brevets, 1000K or 1200K rides, or other endurance rides. Coffeeneuring was born out of a desire to change the pace from the intense summer rides required to train for a long-distance event to leisurely destination rides to local coffee shops. Based loosely on randonneuring, coffeeneuring followed the spirit of randonneuring in riding for fun and accomplishment, the pursuit of completing a set number of rides, and providing evidence of each ride’s completion. Instead of brevet cards and receipts, though, people submitted short descriptions and photographic evidence of their coffeeneuring trips. Also, because randonneuring has its fair share of rules, coffeeneuring needed several rules, too. In terms of randonneuring events, it was designed to vaguely resemble an R-12, where participants complete a 200K or more each month for 12 consecutive months. Obviously, it differed from randonneuring in a variety of ways. If a person embarked on a 200-mile ride for a cup of coffee that was perfectly acceptable, but if somebody decided to do the minimal two-mile jaunt to see their favorite barista, the two-mile ride qualified just as much. Brevets and permanents all have time limits within which the rider must complete the event. 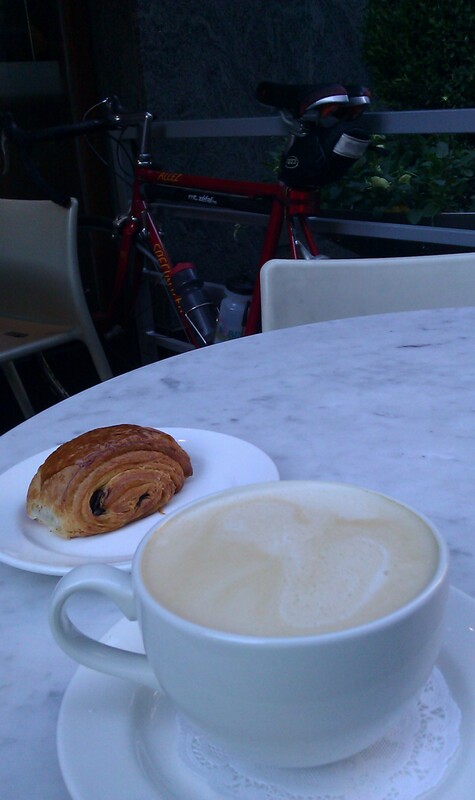 In coffeeneuring, there was no minimum average speed requirement to successfully finish a particular ride. Coffeeneuring did not require perpetual forward momentum. If people wanted to ride to the coffee shop and then hang out there for hours, they were welcome to it. Coffeeneurs just had to be sure they finished the minimum number of rides (seven) within the days and timeframe of the Coffeeneuring Challenge (six weekends of riding from September 19-November 2). The Coffeeneuring Challenge brought together randonneurs, commuters, transportation cyclists, and the java-obsessed on two wheels. Many randonneurs bridged the gap of long-distance riding to coffeeneuring quite nicely. Bill A. of Oregon named all of his coffeeneuring destinations “controles,” a reference to the required stops randonneurs must make on an organized randonneuring event. Bill completed eight rides over the seven weeks of the challenge, and continued coffeeneuring even after his successful Coffeeneuring Challenge completion. Rumour has it he’s in pursuit of a C-52, which is a visit to one coffee shop a week over the course of a year. Coffeeneuring gone wild! Sometimes randonneurs don’t like to take the “easy” way. It’s not enough to abide by all the rules; they want to add even more rules, just for them. Like Bill, Ted T. (who I featured a few weeks ago here) wanted to take his coffeeneuring up to eleven by completing each of his coffeeneuring rides using a different bike. That’s right. It wasn’t enough to complete seven rides, at least two of which were on snow-covered roads. 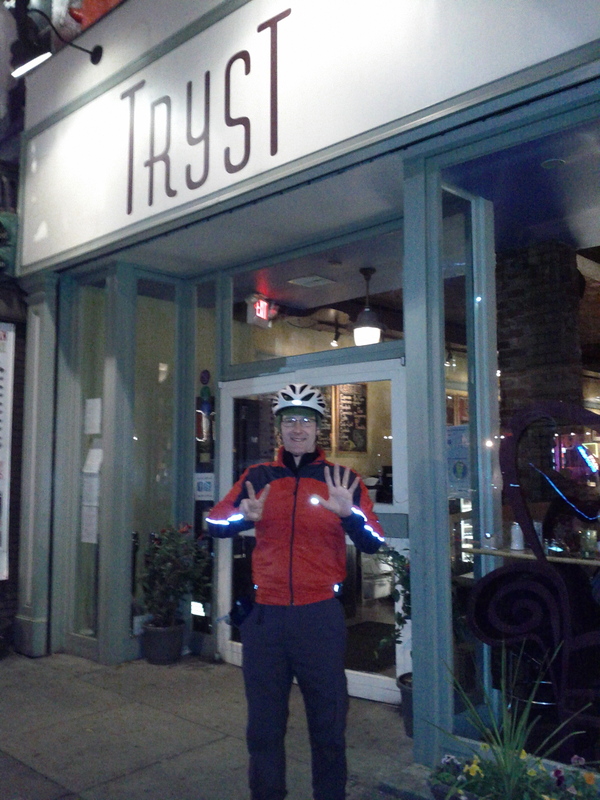 Ted met his unique goal by completing eight rides on seven separate bikes during his Coffeeneuring Challenge. Randonneur George S. consistently coffeeneured with visions of the R-12 dancing in his mind. Don’t believe me? Six of his seven rides reference both coffeeneuring and the R-12. Read his coffeeneuring exploits and R-12 observations at the Hudson Valley Randonneur blog and see. He even dovetailed one 200K with a special coffeeneuring ride, making sure both his coffeeneuring and R-12 dreams stayed alive. Mike B., of Chesapeake Sailor and a D.C. Randonneurs and Randonneurs USA member (RUSA), was pretty certain that he was Coffeeneuring USA member number three, or CUSA #3. (By his calculations, I was CUSA #1, Felkerino CUSA #2.) Maybe next go-round we should incorporate and inscribe members. Mike also liked to refer to me as the chief Coffeeneuse, and another randonneur I know liked to use the title Coffeeneuse Prime (randonneuring, coffee, and Transformers, oh yeah). Thanks, guys! Coffeeneuring meets randonneuring would not be complete without the inclusion of a big breakfast and a bottomless mug of diner coffee. 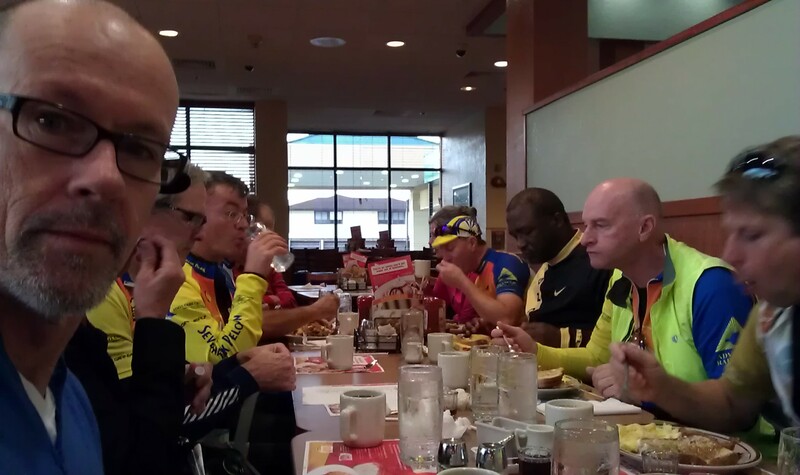 Kelly S. submitted his 114-mile coffeeneuring trip to Denny’s with the Severna Park Peleton as one of his seven qualifying rides. I appreciate that Kelly tried to salvage his coffeeneur reputation by saying “coffee was had and I ate oatmeal.” Sure, Kelly. Randonneur rumour has it you also ate two eggs, five strips of bacon, and hash browns to get you down the road. There’s nothing quite like that feeling on a brevet when you realize that the clock is working against you, and you just don’t know if you will make it to that next controle before it closes. Unfortunately, that happened to Felkerino, who signed up to ride a populaire on the last day of the Coffeeneuring Challenge, requiring him (and by default, me) to venture out on our bikes for an additional ride to coffee. With three hours left on the coffeeneuring clock, Felkerino downed his final cup of espresso, making him an official finisher of the Coffeeneuring Challenge. JUST under the wire! Thanks to all the cyclists and coffee/hot beverage drinkers who participated in at least one ride during the inaugural Coffeeneuring Challenge. Thanks to you, I had a great fall full of excellent coffee shop outings. Let’s do it again sometime. I just love this post. It cracks me up to see riding buddies — real and virtual — out getting their proverbial cards stamped. I think I’ll go on a coffee shop run tomorrow. Isn’t it awesome!? Hope you made it out to the coffee shop, Joe!